Graham Clark (born 31st March 1956) was a Scottish Cross-Country International athlete. Tragically, he died young in 2003 and since then Carnegie Harriers Running Club have organised the Graham Clark Memorial Race every August. This is 3.9 miles in length: three laps of the Knockhill Racing Circuit near Dunfermline. Below is a profile of this talented, sadly-missed runner. At the very start of Graham’s athletic career, a major influence was Olympic Marathon runner Donald Macgregor, who contributes these memories of his young protégé. “I first met Graham when he was a third year pupil at Dunoon Grammar School in 1972. I had just got back from the Munich Olympics and taken up my new job as Principal Teacher of Modern Languages. I had written an article for the school newsletter in which I described my experiences and asked if any pupils wanted to come running with me. Only around three or four responded. Graham was clearly the best of these, and in a group we ran around 3.5 miles round Hafton Estate. Soon Graham and I started going longer runs up Glen Massan and over the hill to Kilmun, an extremely hilly route through Puck’s Glen. On one occasion Kenny Moore (USA Olympic Marathon runner) and his wife came to visit me in Dunoon, and we went out with them on a sunny but damp day. Graham, whose father worked as the school janitor, by now was doing quite hard fartlek with me, although he did not come on my long Sunday runs over 15-20 miles. We were more like club mates than pupil and teacher. At the end of fourth year (I think), he left Dunoon and went to work for the Ordnance Survey in Southampton. That didn’t last too long and he was soon back in the area, and joined Spango Valley AC. I had left Dunoon by then, and saw him only occasionally at races. 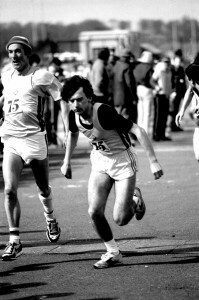 In the Edinburgh to Glasgow Road Relay, Graham Clark first appeared for Spango Valley in 1977, when they finished 21st and last. However Graham moved up four places on the classy Stage Two and finished only three seconds slower than his erstwhile mentor Don Macgregor. In 1978, Graham’s club improved considerably to tenth, and he was sixth-fastest on Two, gaining five places. In 1979 Spango repeated tenth place, but Graham gained no fewer than eight places on Two and was third-fastest. In 1981, Spango won the most meritorious performance medals for finishing seventh, with Graham gaining three places on Stage Four (third fastest). Finally in 1984 Spango Valley were the third team to reach George Square, with Graham having moved them into that position on the long Stage Six. 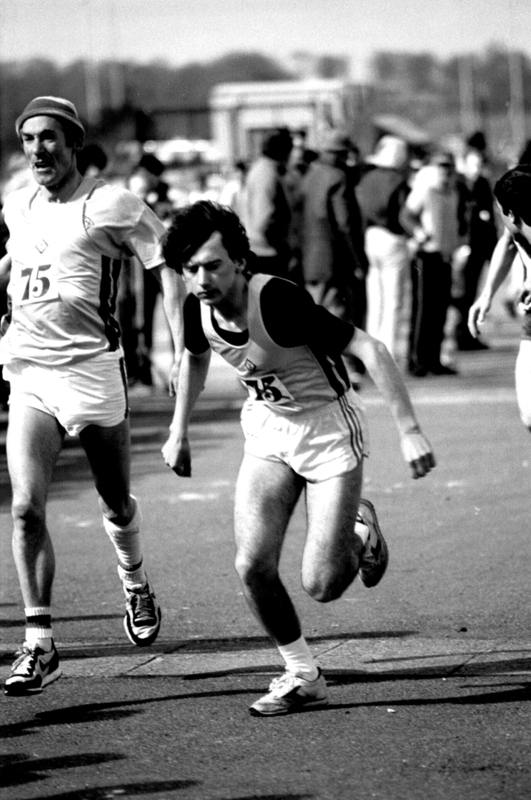 In the Six-Stage Road Relay, Graham Clark’s best run was in 1980, when Spango ended up fourth and he was sixth fastest on the long leg. Then in 1984 he was one of the team that won bronze medals in this Scottish Championship event. Graham’s best times on the track all dated from 1982: 3000 metres (8.13.5); 5000m (14.38.42); 10,000m (30.28.4). There was little doubt that his favourite surface was the country. In the West District Senior CC he was third in 1978; second (by six seconds to Brian McSloy) in 1979; and second again (by only three seconds to McSloy) in 1980. In the West District CC Relay, Spango finished second in 1977, but enjoyed a day of triumph in 1979, when Hammy Cox, Graham Clark, Tom Dobbin and Cameron Spence led from start to finish. Graham recorded the third-fastest time in that event. Other highlights recalled by Cameron Spence include the following. “Graham first ran for Scotland in 1977 and finished second. He won his first Renfrewshire title in the 10 mile Road Race Championship in 1979; in the same year he won his first Renfrewshire CC title. The Scottish Senior National CC Championship was perhaps the setting for Graham Clark’s greatest runs. In 1979 he was seventh, and unlucky not to be selected for the World CC. However he made no mistake at Irvine in 1980. In his centenary history of the SCCU, Colin Shields wrote the following. Graham Clark finished an excellent fourth, only 8 seconds down on the illustrious Hutton, and in front of so many international runners, such as Lawrie Spence, Gordon Rimmer, Brian McSloy, Jim Brown, John Graham, Cameron Spence, Ron MacDonald, Fraser Clyne etc. In the World CC Championships on the Longchamps Racecourse in Paris, Graham Clark was sixth counter in the Scottish team which finished seventh. This was to prove Scotland’s best team performance in the World Cross while participating as an individual nation between 1973 and 1987. Graham was tenth in the National in 1981; ran for Scotland again in the 1982 World Cross; and finished 13th in the 1983 National. Cameron Spence added the following.